Episodes three and four will stream live today at 3:30 p.m. PT and tomorrow at 1 p.m. PT from Willow Springs International Raceway in California. Hosted by journalist and producer Selema “Sal” Masakela, Munn and Rae ride in the “hot seat” of the Audi R8 where they will be challenged to answer viewers’ "Ask Me Anything" (or AMA) questions at speeds up to 130 mph. Munn is best known as Sloan Sabbith on the television series The Newsroom and Psylocke in the film X-Men: Apocalypse. Rae is a writer, producer and actress best known as the creator of the YouTube web series Awkward Black Girl. People can watch the broadcast live from Audi of America’s YouTube, Facebook and Twitter, as well as Audi’s Reddit profile page. 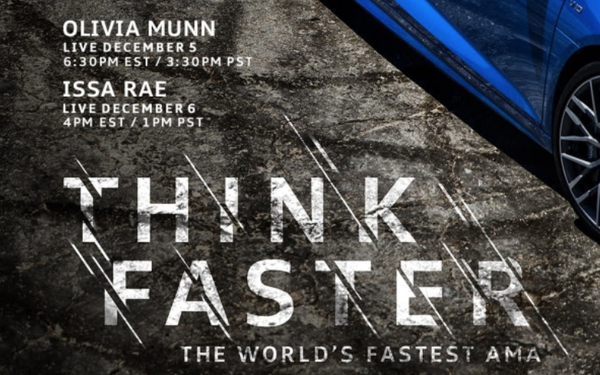 San Francisco-based MUH-TAY-ZIK | HOF-FER created “Think Faster” in partnership with Reddit. Autosport Labs provided auto telemetry and race capture systems for the “Think Faster” production, providing real-time data from the Audi R8 that will be used during the live broadcasts. The episodes follow the first two “Think Faster” broadcasts earlier this fall, which featured Elizabeth Banks and Adam Scott.